Holwood Farm Shop and Deli offers foodies a true taste of the ‘Garden of England’. “The queen was in the parlour, eating bread and honey ...” So goes the children’s rhyme Sing a Song of Sixpence, which has its origins in the 17th century. It’s no coincidence that it was honey which adorned the queen’s bread, as this was a sign of great wealth at the time. These days, you don’t need to be royalty to spread the golden elixir on your bread, but it’s more precious than ever, for the future of the honey bee is far from certain as beekeepers continue to report heavy losses. Honey may last forever [it’s been found in ancient tombs], but bees are dying. Entire colonies simply disappear, leaving their hives anything but abuzz with activity. When you consider that, in summertime, each hive is home to around 80,000 bees, 90 hives is a colossal loss. Dan believes this devastating problem can be traced back to pesticides which interfere with the bees’ homing instincts, and we understand that pesticides are indeed a worry for many British beekeepers. They are not alone. There is great concern across Europe about the collapse of bee populations and the European Commission has acted to restrict the use of pesticides linked to bee deaths. These neonicotinoid chemicals [a class of neuro-active insecticides chemically similar to nicotine] are believed to harm bees, and the European Commission says they should be restricted to crops not attractive to bees and other pollinators. In April 2013, 15 countries voted in favour of a ban, which came into force last December. Interestingly, Britain voted against, despite the presentation to Downing Street of a petition signed by 300,000 people. The ban will remain in place throughout the EU for two years unless compelling scientific evidence to the contrary becomes available. It will be interesting to see what happens at the end of this period. One thing we can be sure of is that threats to the honey bee are many and complex. The varroa mite, which carries deadly viruses, is still the bane of the beekeeper’s life. Unchecked, it can wipe out entire colonies. Careful husbandry and chemicals can keep it at bay, but it’s an on-going headache. As well as mites, there are also some pretty nasty diseases, so beekeepers need to be constantly vigilant, sometimes having to face the heartbreaking task of destroying hives (and the bees within) to prevent their spread. The beleaguered bee is also under threat from floods, weather conditions [bees can’t fly in the rain or in temperatures of below 15C, yet conversely if it’s too warm they can start feeding during times when they would be inactive, thus running out of food if not fed], farmers tearing out nectar-rich hedgerows to make way for ever-more intensified farming and even attacks from the likes of wasps and Asian hornets. We’re hoping that things will start to improve, not least because of the vital role bees play in pollinating crops; around a third of our food would not be available without them. With spring finally here, a BBKA spokesperson says, "Last summer was better for bees with much warmer weather than the previous year but this time of year can be tricky for honey bees with winter stores running low. Beekeepers across the country will be checking their colonies to make sure they have sufficient stores to see them into spring and we hope that more colonies survive the winter than in previous years. Gardeners too will be busy preparing for summer. We ask people to think about planting bee friendly plants to help all pollinators." 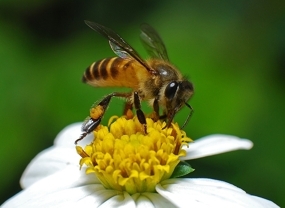 Below are a few ideas that we can all do to help the honey bee. Meanwhile, whether you swear by local honey to help ward off hayfever or just fancy some delicious natural sweetness on your toast, you’ll be pleased to know that we stock a selection of Dan Geary's Pure Kent Honey, including Royal Kent Honey with added pollen. To read more about the plight of the honeybee, log onto the British Beekeepers’ Association website (www.BBKA.org.uk). Join your local division of the British Bee Keepers Association. You don’t have to keep bees yourself to join in and learn about bees and you will be able to visit the apiary and meet local beekeepers. Buy local honey – it will cost more that mass-produced supermarket varieties but it will be unadulterated, not churned up with other honey from across the world. This is great for hayfever sufferers who are seeking some degree of immunity by ingesting local pollen. Buy other local bee products including wax, pollen and propolis, available from health food shops.